Hooray! A big congratulations to Emmanuel Lubezki, who just won the top honor at the American Society of Cinematographers (ASC) Awards for Outstanding Achievement. 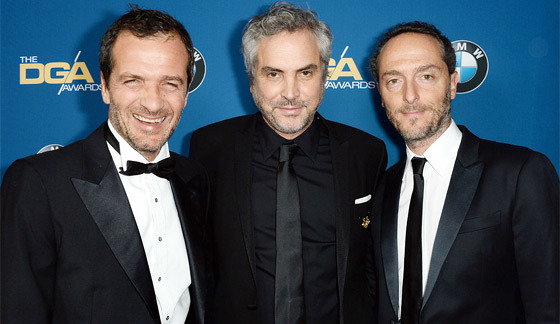 Lubezki won the award for his work on Alfonso Cuaron's Gravity, which is picking up awards left and right including Best Director at the DGA Awards a few weeks ago (where the photo below is from). Lubezki was up against a tough set of five other nominees this year, including Sean Bobbitt of 12 Years a Slave, Bruno Delbonnel of the Coen Bros' Inside Llewyn Davis, Barry Ackroyd of Captain Phillips, Philippe Le Sourd of Kar Wai Wong's The Grandmaster and Phedon Papamichael of Alexander Payne's B&W film Nebraska. Read on for more 2014 winners details. The other big winners at the 2014 ASC Awards: Jeremy Benning won the TV movie/miniseries award for Killing Lincoln. Jonathan Freeman took home top honors in the one-hour episodic television category for "Game of Thrones", and Blake McClure was the recipient of the half-hour episodic series award for "Drunk History". Last year Roger Deakins won the ASC Award for Skyfall, but was not nominated again this year for his cinematography on Prisoners. Instead it was Lubezki who took home the win, landing his third victory out of four nominations. In the past he's won ASC Awards for Terrence Malick's The Tree of Life and Children of Men, but not for Sleepy Hollow, despite a nomination. Onwards to the Oscars next? Most likely. A few other winners: Acclaimed filmmaker John Carpenter presented the ASC Lifetime Achievement Award to Dean Cundey, ASC. Cundey first attracted widespread attention when he teamed with Carpenter on Halloween (1978). The two filmmakers went on to collaborate on The Fog, Escape from New York, The Thing, Halloween II and III, and Big Trouble in Little China. Cundey’s work on Robert Zemeckis’ landmark, live-action film Who Framed Roger Rabbit (1988), garnered him both Oscar and BAFTA nominations. Ida, shot by Lukasz Zal and Ryszard Lenczewski, won the inaugural ASC Spotlight Award. This award was created to recognize outstanding cinematography in features and documentaries typically screened at film festivals, internationally or in limited theatrical release. ASC members submitted entries for consideration which went before a Blue Ribbon panel that chose the nominees. All active members voted. Also nominated for a Spotlight Award were: Mark Lee Ping Bing for Renoir, and Camille Cottagnoud for Winter Nomads. As a fan of Gravity and specifically Emmanuel "Chivo" Lubezki's breathtaking, groundbreaking camerawork and cinematography, I'm very glad he won this. The ASC seems to love and acknowledge Lubezki as much as all of the fans do, as he has won two other times in the past, but it's good to see him win again. Though I must give a nod to all of the other nominees, specifically Bruno Delbonnel for Inside Llewyn Davis, one exceptionally-shot film, along with Deakins' work in Prisoners, McQueen's 12 Years a Slave, Ain't Them Bodies Saints (DP: Bradford Young), Spike Jonze's Her (DP: Hoyte Van Hoytema) and of course Gravity.